Your LolPol headliner this month is Chris Ryan! 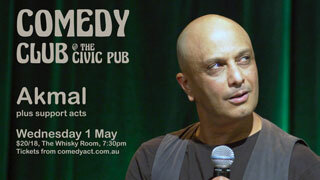 As we approach the comedy festival season, one of Canberra’s finest will be treating us to a feature-length set. If you want stories, unique takes, honest appraisals – without taking itself too seriously – this will be right up you alley. Chris is easily one of the most astute and polished performers that call this Territory home, so plan accordingly. Show will be hosted by Anthony Tomic, with support sets from Taylor Coughtrie, Simon Bower and Cy Fahey.